List Price at Contract: $425,000. I haven’t profiled a condo in a while, so here’s a look at Victoria Court. This property, which was built in 1981, has a total of 12 units and 6 deeded parking spaces. (Deeded parking spaces are favorable in urban markets, where they can theoretically be sold independent of a residential unit.) 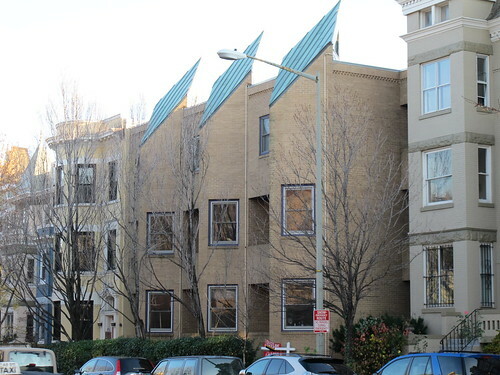 Located in the vicinity of Dupont Circle, Adams Morgan, and the U Street Corridor, this two bedroom, duplex unit features an updated kitchen, a fireplace, and both a patio and a balcony. This unit did not include a parking space with the sale. A sales history for Victoria Court exists in the multiple listing system for sales since 1996. I’ve compiled the sales history ordered from lowest sales price to highest, with date of sale shown at the right side of the report, which can be seen here. There is some discrepancy on the data, particularly in the year built date, which is odd since all of the tax records clearly state the date built as 1981. I’d like to make note that one of the reasons I started including type of financing and amount of down payment is because in previous Good Deal or Not (GDoN) comments, there has clearly been a range of understanding of current financing options. We’ve seen significant changes in the lending industry guidelines over the past couple of years, particularly in terms of higher down payment requirements for conventional loans, the disappearance of second trusts used as a financing strategy to avoid mortgage insurance, the increase in the use of FHA (Federal Housing Administration) loans, and the resurgence of the requirement for private mortgage insurance. Continues after the jump. One of the reasons a buyer may choose to work with an FHA loan is because the down payment is typically 3.5%, compared to at least 10% for conventional products. In the recent past, buyers were able to use FHA financing for condos, even if the entire building had not gone through an FHA approval process. If the building met certain criteria, including a restricted percentage of investor-owned units, for example, then it could be allowed through a lender-submitted FHA spot approval process. The spot approval has recently been done away with and FHA now requires entire buildings to be approved. New construction condos are typically up to speed and are applying routinely, but older buildings may no longer be eligible to FHA buyers until the entire building submits an application. Buildings that have been previously approved for FHA financing will have to re-apply after two years. It now may actually be easier for FHA buyers to purchase a house or a new construction condo (with restrictions, of course) than to buy in older buildings. This is probably very confusing information, especially for people who have not recently or ever financed a real estate purchase. If someone is thinking about the possibility of buying a property in the near future, the best thing you can do to get started is to get recommendations for two or three loan officers. Understanding financing options is a crucial first step in the buying process. If you own a unit in a condo, the association may want to consider looking in to applying for FHA approval and making sure that any subsequent sellers advertise an approved status in their listings. hcl88 Omg I just got your comment. Hahahahaha sorry. So good!